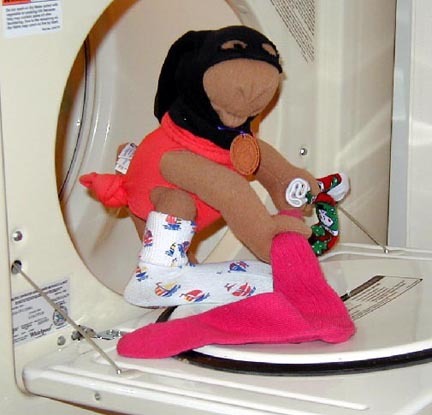 The Sock Bandit, a.k.a. The Hamper Sleuth. Description: Short (11.5"), wooly and beige. Beady button eyes, wired arms and fingers (three). Wearing black sock mask and bright body stocking. Distinguishing features: large nostrils. Always carries three odd socks. Signed and numbered. Last Sighting: Central High School, Boys' locker room, one foot in the gym bag. "Tube, ankle, tennis or knee, Striped, ribbed, or lacy - all free"
Master of the single steal, faster than the spin cycle, a mere blur in the locker room, the Sock Bandit prides himself on sleuth. Last spotted eyeing the laundry basket.